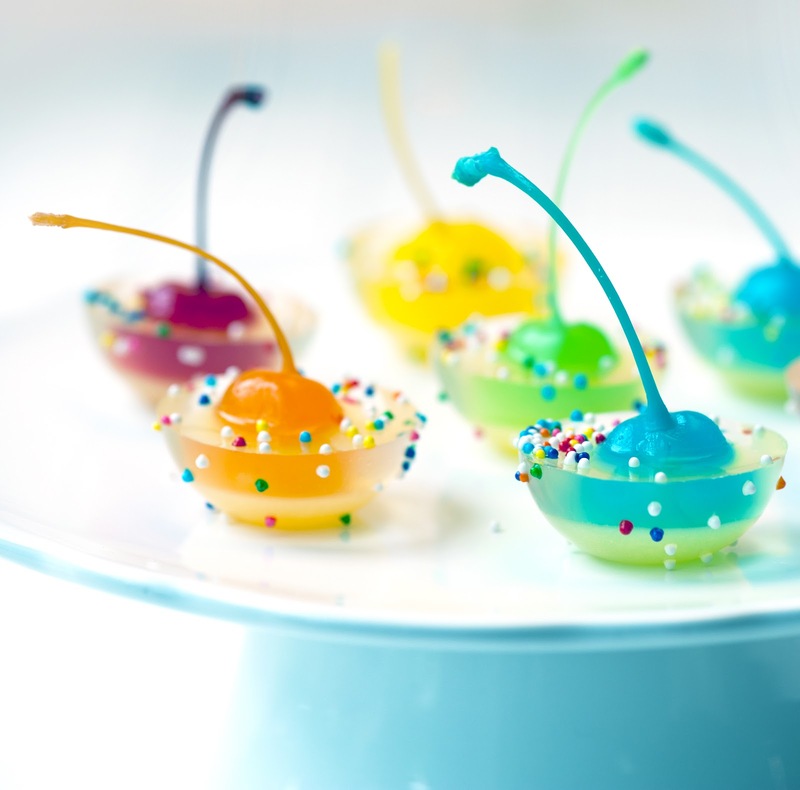 Rainbow Cherry Jigglers, ready to party! and couldn't wait to work them into our bag of party tricks! Prepare hemisphere flexible silicon molds by wiping the mold cavities with a paper towel moistened with a a little vegetable oil (or a quick spray of unflavored PAM will also work). Then, wipe the mold cavities with a clean paper towel. This method will leave just the slightest residue, which will help unmold the gelatin without affecting the taste. Place each mold on a cookie sheet or cooling rack to provide a stable surface for handling. 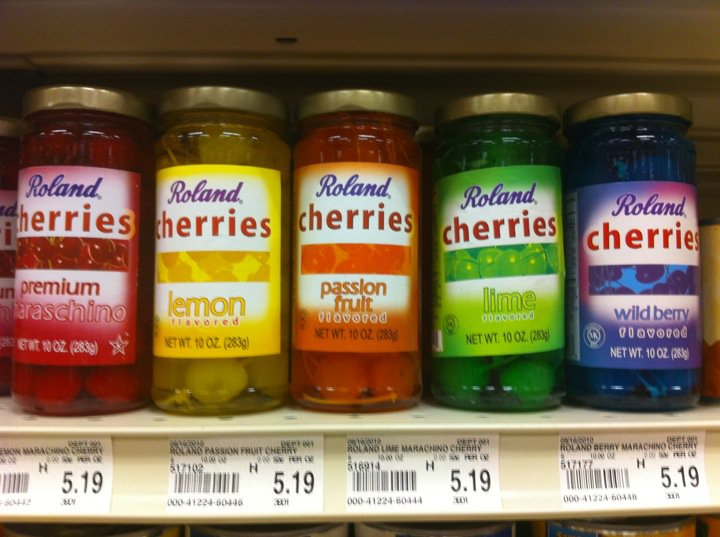 Prepare your cherries. Cut the bottom end off 30 maraschino cherries. 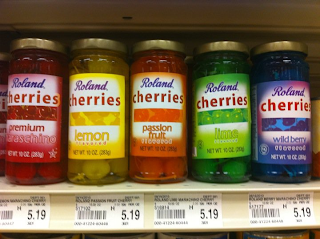 This will allow the cherries to stand up on the gelatin without toppling over. Place the cut cherries on a paper towel to drain. Place juice in a saucepan and sprinkle with the gelatin. Allow to soak for a minute or two. Heat over very low heat, stirring constantly, until gelatin is dissolved (approximately 5 minutes). Remove from heat. Fill each mold cavity 1/3 full with the gelatin mixture. Place molds in refrigerator until gelatin has set, 30 to 45 minutes. Prepare clear layer. Place juice in a saucepan and sprinkle with the gelatin. Allow to soak for a minute or two. Heat over very low heat, stirring constantly, until gelatin is dissolved (approximately 5 minutes). Remove from heat and set aside to cool slightly (about 15 minutes). When the mixture has cooled, remove the molds from the refrigerator. Place a cherry, cut side down, in each mold cavity. Fill each mold cavity to the top with the reserved clear gelatin mixture. Return molds to the refrigerator, and chill for several hours (ideally overnight to avoid separation in the layers when unmolded). To serve, carefully pop the gelatin out of the molds and place on serving plate. Immediately before serving, dust with multicolor cake sprinkles.